Welcome Autumn! The leaves are changing colors and starting to fall, and temps are dropping. Here in Colorado we're even starting to see snow on the mountain peaks. But before winter sets in, there's still plenty of time for fall fun. Visit a Corn Maze. Split up into teams and see who can make it out first! Have each team chronicle their maze experience with photos that can be shared among the group afterward. Before you leave, be sure to enjoy a yummy fall treat like a Carmel apple or hot cider. Decorate Pumpkins. Have each student bring a pumpkin and gather together to create your own collection of pumpkin masterpieces. Whether spooky or silly, carved or painted, each pumpkin will be as unique as the students decorating it. Provide all the supplies and some fun fall snacks. Go on a Hay Ride. Find someone in your church or community with access to a farm or ranch where you can meet for an afternoon or evening hay ride. On the ride, sing songs and tell stories – encourage everyone involved (students and volunteers) to share their favorite fall memories. Make Apple Pies. Visit a local apple farm or farmers market to choose the best fruit for your fall treat. As a group, and with the help of a seasoned baker, make a batch of fresh apple pies. Bonus: Take them to a retirement community and share your dessert à La Mode with the residents. Host a Harvest/Halloween Party. Here’s your chance to dress up and be silly! Serve up some scary-fun foods, and try a few of these fun fall games. Play a Game of Flag Football. Plan a Saturday to meet up at a local park for some fun and competition. Losers treat the winners to cheap pizza! Build a Bon Fire. Enjoy a crisp fall night around a warm fire with roasted marshmallows and s’mores. Bring a thermos of hot chocolate and sing your favorite camp songs! 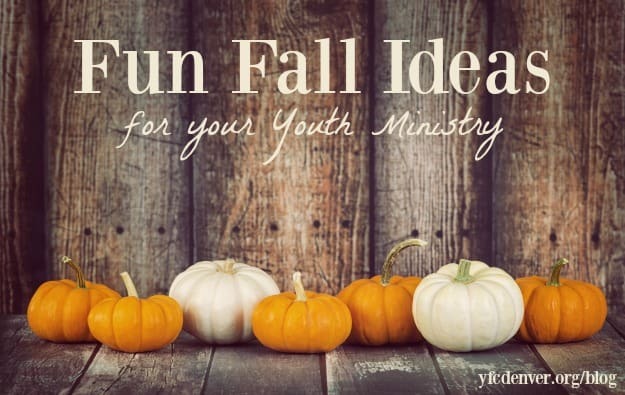 What’s your favorite youth ministry fall activity? Share your ideas below!